It was once known as St. Peter’s Lutheran Church when it stood on its original site located on S. 68 th St., north of Rawson Avenue. Built in 1869 by German Lutherans who had left St. Paul’s Lutheran Church in Franklin, the church remained in operation until the early 1880’s. The church building was also used as a school with classes being taught by the Pastor of the church. Recently a photo showing the church on its original site was donated to the Franklin Historical Society by descendants of one of the original members. It shows the Pastor with his class in front of the church the Pastor’s wife looking out of anupper window of the church. Then in 1983, almost 100 years from the church’s closing, the chapel was moved to the Franklin Historical Park by the Franklin Historical Society. What remains on the original site on S. 68th St. is the St. Peter’s Cemetery, where early church members and later descendants are buried. 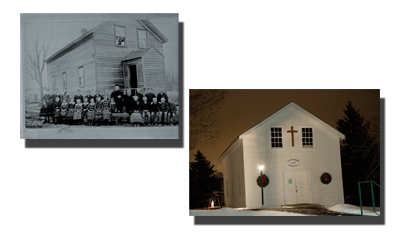 Today the chapel is registered as a Milwaukee County Historical Landmark and is the site of the annual non­denominational Christmas services sponsored by the Franklin Historical Society. Those services are held each year on the second Saturday in December and include both German and English carols.Throughout the year the chapel is also available for rent to couples who wish to have their wedding ceremony take place in a historical setting.